Publisher: Toronto: Second Story Press, 2014. Opening Sentences: Dear Grace, I have been accused of a crime! Someone stole Nancy Collier’s brand-new glow-in-the-dark yo-yo today. Miss Noonan did a desk check. I wasn’t worried (why would I be? ), but guess where the yo-yo turned up? Mom didn’t get out of bed all day. She pretended she did, but I can tell. Synopsis: This is the sort of book you daren’t say too much about, because spoilers would definitely… spoil things. But – once in a while, there’s a book that must be read cover to cover with as few interruptions as possible. This is that sort of book. One of the best things about devouring a book is that, unlike food, the book is still there to devour all over again. As soon as Hope learned how to write letters, she started writing to her imaginary friend, Grace. Her only friend, Grace. Hope doesn’t have the knack of making friends. She and her mother move a lot, when they can no longer afford the place they’re living in, so Hope changes schools a lot, too. That doesn’t help. Hope’s mom hasn’t been to work for quite a while. She’s too depressed to get out of bed, most mornings. When Mom finally goes back to work, her job has been given to someone else. They move in with Granny, the last possible place for them. Then Granny dies. 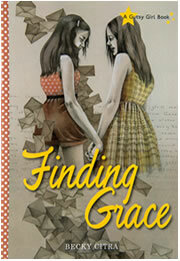 Shortly after that shock, Hope discovers a secret, a secret that turns her world – and her ideas about Grace – upside down. I can’t say anything more without saying too much. All I will say is get to a bookstore or a library, and get this book! The author is Canadian, and has written nineteen books for children. Her website, BeckyCitra.com, says that one of her kids’ book series is Jeremy and the Enchanted Theatre, a time travel series. Guess what I’ll be looking for next? What an intriguing storyline. I’m hooked! My kind of a book! Your synopsis hooked me immediately. I love realistic fiction. This has a real twist in it that will surprise you, Pat! I have some trouble with long books, but this one sounds pretty intriguing – and that Gutsy Girl tag grabs me. It is longer than the books you usually read, Rhythm, but it’s a good book — and I’m going to see if there are other Gutsy Girl books. I like that name, too! This sounds utterly amazing and one that I’d like! 🙂 Thanks for telling us about it! You’re welcome, Erik! Hope you enjoy the book! This sounds excellent, Beth. Thanks for making me aware of it and for the great review. This feels kind of an evergreen story in the Secret Garden type of way! Thanks for the introduction to book AND author! You’re very welcome. I think the book will take you by surprise — in a good way. This sounds like a great book, one I would love too. Thanks for not giving too much away Beth.